This Week's Featured Advertisement: Two Gently Used Romeo 25 Braille Embossers for $1,100.00 USD Each!!! 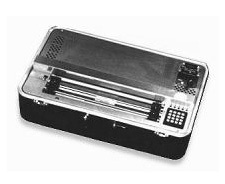 Flying Blind, LLC is pleased to offer Two Romeo 25 Braille Embossers for $1,100.00 USD Each!!! That's right. That's over $1,400.00 USD off of their suggested retail value!!! Manufactured by Enabling Technologies, the leading pioneer of Braille embossers, these units showcase decades of Braille embossing know-how at an incredibly affordable price. These rugged workhorses have been used for less than 10 hours each and are in fantastic condition. Each unit ships with a USB converter, allowing for seamless connectivity with your computer or notetaker for instantaneous hardcopy Braille! Price also includes shipping within the 48 Continental United States, providing an additional $70.00 USD value. To be the first to secure one or both of these units, please use the Buy Now link included below. For more information, or to order this product offline, email featured@flying-blind.com or call +1 (216) 381-8107 today! And don't forget that our March Madness Specials end on Monday, March 31st, at which time we'll be drawing a lucky winner for that BookSense XT, so buy one of these embossers, and enter your chance to win!! !